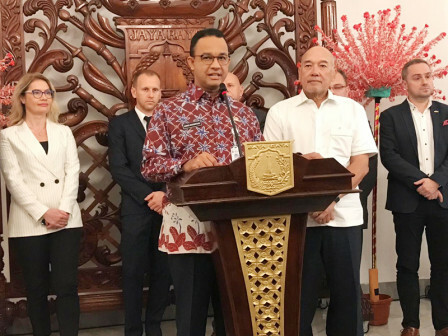 " This first meeting is to explore cooperation and investment potentials in Jakarta"
Jakarta Governor, Anies Baswedan received delegation visit from Polish businessmen to review about potential and opportunities for cooperation in waste management, energy, and employment sectors. According to beritajakarta.id monitoring, Indonesian Ambassador to Poland, Peter Frans Gontha also came to accompany the Polish businessmen in this delegation visit. "This first meeting is to explore cooperation and investment potentials in Jakarta. Polish businessman delegation who come today has various business sectors," conveyed Anies at City Hall, Thursday (10/25). He mentioned that he welcomes their visit and hope it can give positive impacts in some sectors in Jakarta. "We want to increase job opportunities and solve problems in Jakarta through cooperation with other countries, including with Poland," he stated. Meanwhile, Indonesia Ambassador to Poland, Peter Frans Gontha said, Polish businessmen delegations visit Indonesia in order to attend Trip Expo Indonesia. "We took the time to meet Jakarta Governor and convey some possibilities that can be cooperated between Poland and Jakarta," he stated. According to him, other delegations in this visit have businesses in waste management with latest technology basis and drinking water company. Some of them are also professional experts. "We also review about education, hospitality, and job opportunity sectors. Poland wants to absorb 20 thousand employees from Indonesia," he conveyed.